This full motion ride simulator is based on the Star Wars universe though it doesn't use film from any of the movies. On a shuttle ride to Endor, it turns out the pilot is making his first flight and things don't go as smoothly as could be hoped. Location: Immediately to the right as you enter Tomorrowland from the Main Street, U.S.A.
# of Ride Units: 4 separate simulators. Wait Times: Wait times of 30-40 minutes are not uncommon as it is a slow-loading attraction. Length of Ride: 5 minutes. Queue Description: The elaborate queue goes through an active space station from the Star Wars universe, including views of R2D2 and C3PO. 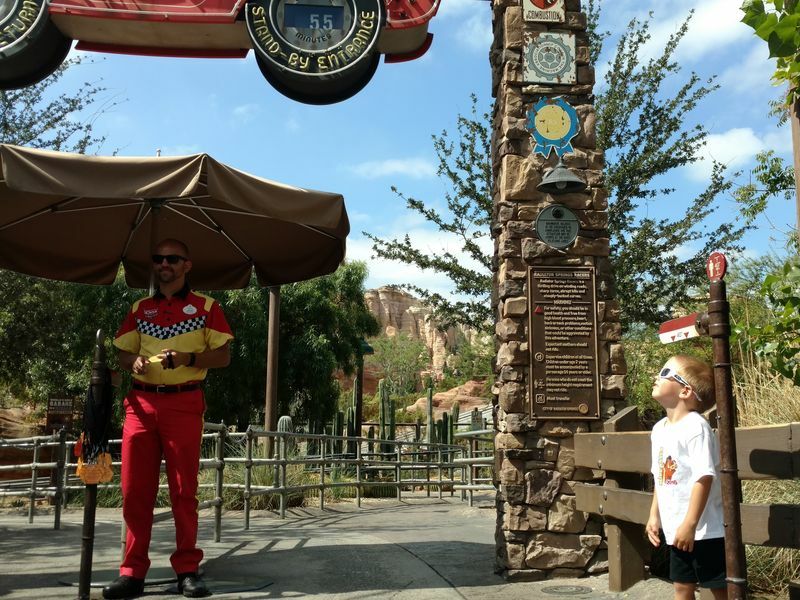 Health Restriction: Guests should be in general good health and free of heart, back, neck, or other conditions that could be exacerbated by sudden changes of direction and speed. Pregnant women should not ride. Ride Access: Wheelchair and ECV users should use the standard queue until they reach the marked door that leads to the loading platform. Wheelchair Transfer: It is required that you transfer from wheelchairs and ECVs into the simulator's seats. You will take your chair into the simulator, transfer, and then the cast member will remove it, returning at the end of the ride. Audio: Closed captioning is available for the pre-show video but not the ride itself. Weight and Size Issues: The seats are large and almost all guests will be able to ride comfortably. Child Swap: Approach the cast member at the entrance to the queue and request a rider switch pass. When the rest of your party exits the ride, two people can return with the rider switch pass through the Fast Pass entrance. Other Issues: This is a ride simulator and may cause stomach discomfort. Very young children have been known to get scared that they�re actually going out into space. At this location: The area occupied by Star Tours originally housed two original attractions from 1955. The first was a 20,000 Leagues Under the Sea exhibit that was originally put into Tomorrowland simply to fill empty space. The exhibit that included walkthroughs of actual sets proved popular and lasted 11 years. The other was the Monsanto Hall of Chemistry, a simple exhibit on chemistry. As part of the New Tomorrowland of 1967 both exhibits were closed and Adventures Thru Inner Space, also sponsored by Monsanto, took their place. That attraction, which shrunk you down and showed you the world at the molecular level, lasted until 1987 when it closed for the construction of Star Tours. The Attraction's History: Other than maintenance Star Tours remains pretty much exactly the same as when it opened. Rumors of a new film have flared from time to time and reached a fevered pitch in summer 2005 when George Lucas told a convention that he was working on a new film for the Walt Disney World version of this attraction.